Effective conservation — from planning to implementation to monitoring — relies on having accurate, informative maps and spatial data. To help guide conservation decisions, Playa Lakes Joint Venture (PLJV) provides the following geospatial tools and data products, including interactive maps, source code for geospatial models, and downloadable data. 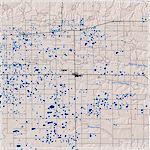 The Kansas Water Map is an interactive tool providing critical information on current surface water, as well as historical information over the last 30 years. 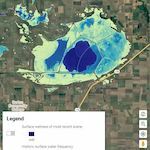 The tool, which was funded by USDA Kansas Natural Resources Conservation Service through a Conservation Innovation Grant, can be used by conservation professionals, landowners, producers, and the general public to examine patterns in surface water distribution. Sometimes, you just need a good old-fashioned map. These county based maps of probable playas can be viewed on a computer or printed out to take with you on the go. The maps were created using our region wide Probable playas dataset. PLJV is committed to making science open and engaging with our agency partners and the public. On the technical-side, we share the source code used to generate most of our mapping products and spatial models. Our tools are made publicly available on Github, a repository used by software developers to share code. A collaborator can quickly and easily download our models and data, make changes, and share those contributions openly with the world. Quality data underlies all of our geospatial tools. While we have many ways to view and interact with those data, you can also download it for yourself. View the list of downloadable data layers, including our probable playas dataset.